I forget the exact date, but it must have been about this time, 25 years ago, that The Oxford Ramble, the first Magpie Lane album, was released onto a largely unsuspecting world. And on Sunday 3rd May 1993 we went on stage for the very first time, at the Holywell Music Room in Oxford. On our website you can read Tim Healey’s account: Magpie Lane – how it all began. And there’s a playlist of videos on YouTube from that very first performance at the Holywell. Here’s how we began the concert. 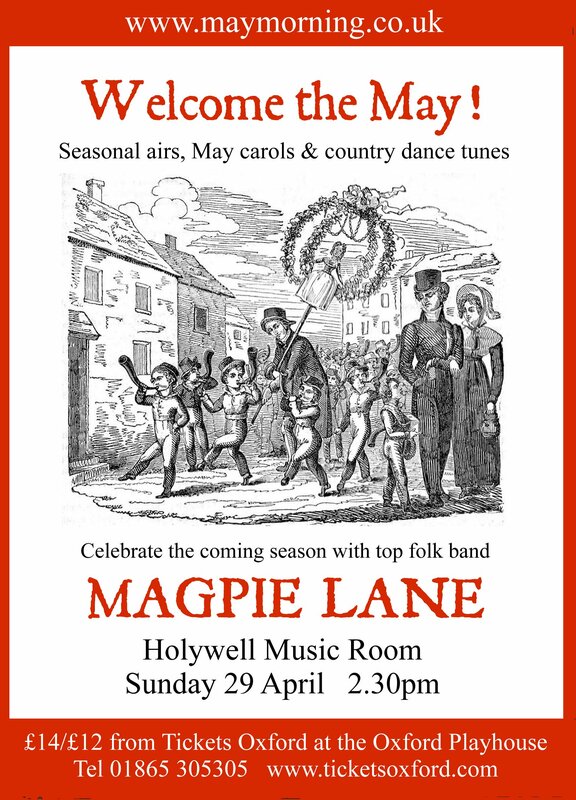 One week today, Sunday 29th April at 2.30 p.m., we’ll be back at the Holywell Music Room to play a 25th anniversary concert. Tickets are available from Tickets Oxford or direct from the concert organiser (and the man without Magpie Lane would never existed) Tim Healey. Details on the poster below, and on our website. I bought that first album not even realising it was you; that was a nice surprise!